Paper clay is a clay that is mixed with shredded paper or other fibers. These fibers create a very strong and versatile clay that is also lightweight. It's perfect for building ceramics of any size, including very large pieces that would be extremely heavy with standard clay. You can buy ready-mixed paper clay at any good ceramics store or make it yourself. Paper clay is made by mixing regular clay with paper pulp. The paper fibers create a strong structure within the clay. This "capillary system" also transfers moisture easily and evenly throughout the clay. Paper clay can be made with a variety of different clays, including terracotta, porcelain, earthenware, and stoneware. Though paper pulp is the most common and easiest fiber to work with, clay can also be mixed with any other cellulose fiber to create the same effect. If you make your own paper clay, you can have complete control over the amount of fiber added to achieve the desired strength. This added strength allows you to easily make slabs that you can fold and bend without the tearing you may experience in more traditional clay. 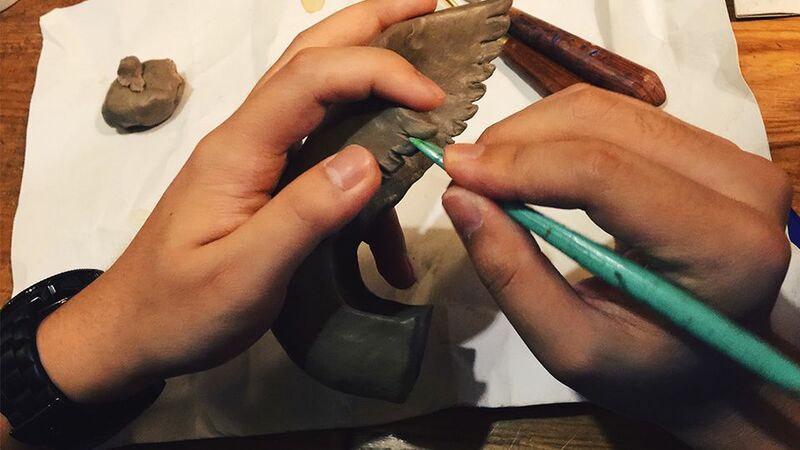 It makes creating shapes through hand molding a dream. Paper clay is also brilliant to use if you are making either a large structure or thinner, more delicate work. The added internal strength of the body clay means that the work can support itself. This also makes it much easier to transport. Paper clay is also excellent for repairing any joins or cracks which may have appeared in your work. In fact, most potters use paper clay to mend flaws, even if the body clay of the piece is regular clay. You can even fix any breaks in bisque-fired paper clay with wet paper clay. Paper clay typically dries more quickly than regular clay because the moisture tends to evaporate much faster. Potters are also known to "force dry" paper clay as drying the work more quickly reduces the chances of it cracking. The firing and glazing process for paper clay can be the same as regular clay, so you generally won't need to amend your normal routine. However, some potters do fire paper clay at a slightly higher temperature. Be aware that the extra fibers which make the work so strong can also make the fired work more porous. During firing, the paper fibers burn away and this can make the work slightly more fragile to handle afterward. Typically, potters use paper clay for hand building. You can throw paper clay, but it doesn’t quite stretch as easily as regular clay. If you are throwing with regular clay, you can make paper clay with any scraps of clay that are left over. It’s fairly easy to make your own paper clay. As a general rule, if you’re making a lighter piece of work, then you will add less paper. When making a heavier piece, you'll want to add more. You’ll need clay slip and paper pulp. Generally, you will need two gallons of recycled clay slip to make 10 to 15 pounds of clay. If you’re using paper fibers like newspaper or printer paper, you will want to prevent mold from developing. To do this, mix in one tablespoon of bleach and then re-mix it before adding it to the clay slip. Pour three handfuls of your paper fiber into your clay slip at a time. Mix well for about 20 minutes, making sure the consistency is completely smooth. Paper clay is best used within about two weeks of making it. Over time, the fibers in the clay can start to disintegrate, meaning the properties of the clay can completely change. This can compromise the integrity of your ceramic piece.